The Topps Company announced today a charity auction for the first Babe Ruth SportsClix figure, and a chance to own a part of history! Only fifty of these extremely rare figures will be made, and the miniature up for auction is number one of fifty. 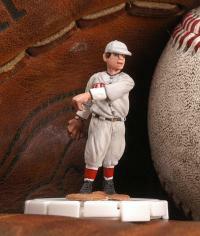 The miniature Ruth, who stands a little over an inch tall, features the Sultan of Swat in his 1917 Red Sox uniform, the year he started more than thirty regular-season games. This figure, hand-sculpted and hand-painted by the award-winning artists at WizKids, Inc., was completed on October 20th, 2004, the night of the Red Sox� historic game seven victory over the Yankees. Topps conceived the figure six months ago, little suspecting that by returning the Babe to Boston on the day of the Sox� win, they may have contributed to lifting the "curse of the Bambino!"